I did just fall in love with this dress. But even if I really really liked it, I have not bought it. Why you may ask? Well I don´t know if I will like it on my self. Maybe I just like it one the model. So I have to think about it before I buy it. The ting is also that I have to post-order it. All know what that means, you can´t try it on before you buy it. You get it home and then you have to try it, if it dosen´t fit you have to send it back. But I have to honest I´m not good at sending it back if it don´t sit right, or worse don´t fit. And there for the second thoughts about buying it. I have more or less decided to see if any of the stores here has the same or something similar to this dress before I order it. I think that it´s smarter to go this way then to just order this dress. But I have to say that Nelly.com has a lot of beautiful dresses. Okay okay, I know it´s like I´m pushing her on you and well maybe I´m. But I really liked her album and This kiss is one of my favoritt songs on the album so when Carly Rae Jepsen finely did come out with the music video, well then I just have to share it with you. So here it is This Kiss song by Carly Rae Jepsen. I have to say that I think the video is fun and with the music it gets me in to a great mood. Hope that it´s more people then me that thinks the music video is great. I´m not really a fan of One Direction, but I like this song. Think the only reason is that it´s a summer song and I love the summer. And there has not been a summer this year. Well there has been a summer, but not any good summer weather. The sun has been hidden behind clouds. So hearing and seeing this music video, takes me to last summer and sunny weather. Lovely. Just what I need to get thru the Norwegian winters. If have not seen it, well then you just have to see it. And you will see what I mean with it being a summer song. This is one of my way out the relatives, to tell the truth I´m not even sure have it is we are related. I think her mother is the daughter to my grandmother cousin our something. So it´s way out there. But even if it´s so fare out we are a family that are close as hell. She and her family lives more then 600 km away, but even so we see each other once a year or more. So I wish her a happy happy birthday, and may her birthday wish come true. I just love this song, there is nothing more to say about it. When I´m out driving this song is one of the songs that I have playing on a really high volume. It makes me happy. What do you think about this song? Like it, love it, hate it, don´t really think any thing about it? I just have to say that Carly Rae Jepsen is one of my new favorite artists. Got to love my cousins little kid, he is just so adorable. Just see for your self. 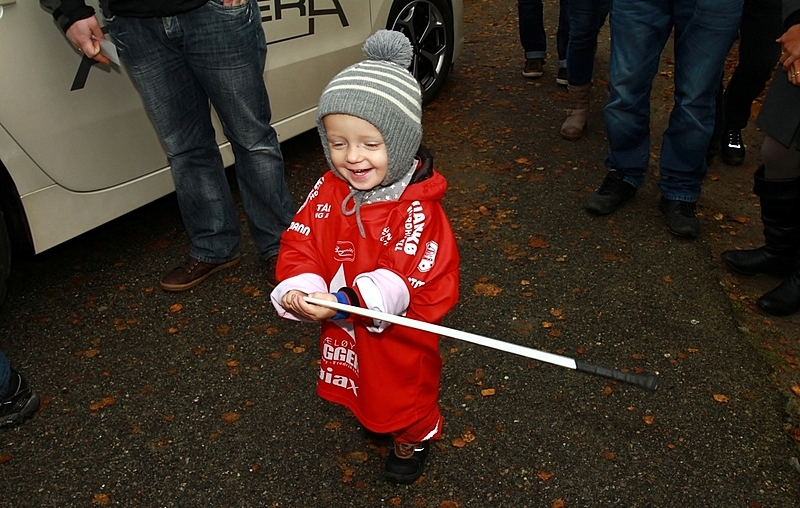 Here he is outside the hockey rink yesterday. Just love him, he took a part of my heart the first time I so him. Hi´s dad is a big hockey supporter, and then hi´s kid just have to be to, right? Wonder is he still will go on hockey games when he can say what he wants? I hope so, because it will break my cousins heart if he don´t, I think. It´s not always Easy with Easy Life, but right now I´m really happy about it. I have now lost almost half of what I want to lose. I have now lost 14,2 kilo and that is something I´m really happy about. The last two weeks has I lost 3,8 kilo. I have to say that I had hoped that it would have been a little bit more, but when I look at the whole picture and see that I have lost 14,2 kilo in total in about six-week. Well then I have nothing to be disappointed in. Because if I may say so, and I will, that is pretty dame good. But it´s not always easy going to the shakes and the stuff I´m eating. Sometimes is it hard, and special it people say bad thing. It´s not that I need people to see that I have lost wight, but when my friends say stuff like one of my friends said it´s hard. She right out said that she couldn´t see any different. And that´s okay kind of, it´s Okay that she don´t see it, but it´s not okay to say it like that. 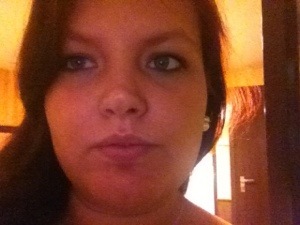 I´m not good at seeing stuff like that my self, wight loss, a new hair cut or color and so on. But if I know that someone has lost a few or a lots of kilo, I don´t tell them that I don´t see it. I then I don´t say anything at all. So I mean that my friend should not had said anything at all, that would have been better. Some may say that friends should get to say that they don´t see it. But No!, they should not. I love my friends and I also love the friend that this to me, but right now I feel that our friendship are kind of one-sided. She say what she want to me, and if I take it the wrong way then I´m the bad one. But if I´m not agreeing with her, well them I´m the bad one. So have is that fair? If she can say what she means and what she thinks all the time, then why can´t I? And when I need a helping hand, well then it´s so difficult for her to help me. And the excuse is that she has kids. But when she needs help I have to come running at once. Because I don´t have kids, so I have nothing that stands in the way. It´s like she thinks I don´t have a life. It should always go bout ways right? It should be give and take, not give and give so the other one could take and take right? But enough of that. I should really take a talk with her and fix things, so this is it. I will not bother you guys with this any more. I will just be happy about my 14,2 kilo light body, and don´t bother about what others say or thinks. I have the tickets to go and see all the Twilight movies the 15 november. The night will end with the midnight premier of Breaking Dawn Part 2. I can´t wait to go and see them all. All the film that are out on DVD are in my DVD collection so I could have just seen them at home before the midnight premier, but it is something special about seeing it on the big screen. Can´t wait to see them all, but I have to say that I´m really really looking forward to see breaking dawn part 2. So are you going to see breaking dawn part 2? No just kidding, but I’m in the air and that’s not a joke. Right now am I and the group I have been traveling with on the air plain on the way home to Norway. After having three lovely days in Krakow Poland. We have had serious time and fun time, shopping time and sightseeing time. We have done it all. 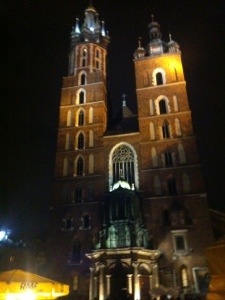 I have not seen all of Krakow, because it’s so much to see but I have seen some. And if the pictures are ok, well then some of them will be seen here. I really want to go bake to Krakow with some friends or something and see more of this city. 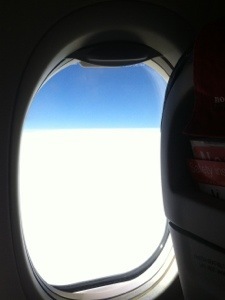 I’m still in the air and having fun. Got to love it. The first day in Poland is coming to an end. 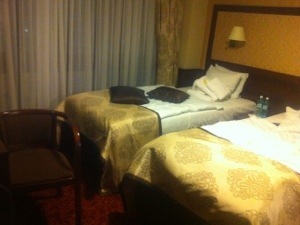 I’m back in my hotel rom in the hotel Wielopole. It’s a small hotel, but I like it. It’s nice and comfy, and from what I can tell right now I think I could really get a good night sleep here. What do my room look like? Well see for your self. It’s a little messy right now, but it’s my mess. 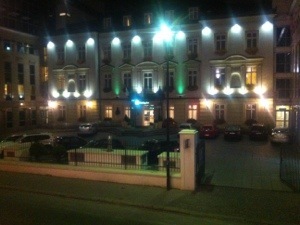 We are here on business and that takes place in the hotel right a cross the street, Holiday Inn. That hotel seems a little more flashy with a casino in the basement and artwork every where you look. It’s lovely. I can see the hotel from my room. And now, so can you. Much of it last night, but I will to day. This is me signing out from Wielopole, Krakow, Poland. Can you believe it?